UPDATE: After we reported on how the ‪#‎PathankotAttack‬ was not just another usual terror incident but related to the International ‪#‎DrugMafia‬ stretching from Afghanistan via Pakistan to India from where it is shipped off to Dubai and Europe, today almost every mainstream media has picked up on it. Not only the drug cartel’s role is highlighted but also the possible nexus of security agencies will also be probed and the now infamous Gurdaspur SP Salwinder Singh (whom Punjan Police tried to portray as a hero) would be investigated by the National Investigation Agency. Punjab, for many years, has been a transit point for drugs from Afghanistan. The drug money has become a major source of funding of elections in Punjab and over the time a well organized drug cartel has came into existence with active connivance of politicians, police officers and drug lords. This drug money is used in financing militancy. To check militancy we will also have to control the drug problem. According to a survey conducted by the Department of Social Security Development of Women and Children, 67 per cent of the rural households in the state of Punjab have at least one drug addict. The reason for this growing dependency on drugs in Punjab is militancy and politics under the shadow of a flourishing international drug trade. Shashi Kant in 2014 had submitted a list of politicians with suspected drug mafia links to the Punjab and Haryana High Court after his earlier letter was admitted as a public interest litigation. 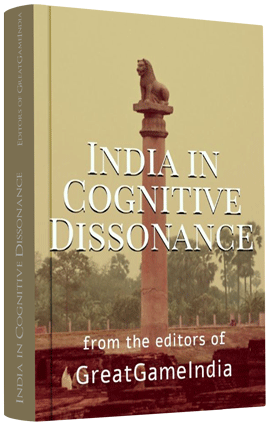 Kant, who was ADGP (intelligence), claimed that it was a four-page list, which was prepared by the intelligence department in 2007, and he gave it to the CM. He alleged that the list was kept under wraps and little action was taken as political careers of those named in it thrived after 2007 even after it was submitted to CM Badal. Now these politicians not only offer drugs to the voters during elections but also get money for elections by selling drugs in connivance with drug lords. Jagdish Singh Bhola, a suspended DSP and Arjuna awardee, and a wrestler-turned-drug peddler who was arrested for masterminding a 700 crore drug racket had made a startling revelation in 2014 that Punjab Revenue Minister Bikram Singh Majithia was also involved in the multi-crore drug trafficking racket. Investigations revealed that state government vehicles were used for smuggling drugs. Patiala Senior Superintendent of Police Hardial Singh Mann, on further investigations had established that the arrested smugglers had funded Assembly elections in Punjab. Raja Kandhola was another drug smuggler arrested by Delhi police from Doraha in Punjab where he was running a ‘factory’ to manufacture synthetic drugs. The names of many Punjab police officers surfaced during investigation but the case was finally hushed up. While dealing with a 2012 appeal by the Centre against the acquittal of some suspected drug peddlers by the Punjab & Haryana High Court another startling revelation that came to light was that only 10 per cent of seized drugs were destroyed by cops. The Supreme Court has said what is burnt by them in the garb of destruction of seized drugs was nothing but “cow dung”. The court said illicit drugs worth crores seized every year was re-entering the market, surreptitiously sold by lower-level staff in the agencies. Many psychiatrists have claimed that the Punjab police are pressuring them to reveal drug patients’ identities. Now the Punjab Police itself is fighting an internal drug war. 50 per cent of the Punjab Police are drug addicts. There are special committees formed to de-addict these cops. Many senior cops have admitted that there is a battle within to fight the drug trade and secret inter-departmental letters are circulated warning the drug addicts in the force. It is because of this intra-war it may be, as explained in our previous article that we have conflicting reports from the Border Security Force and the Punjab Police regarding the route taken by the terrorists and the collected evidence itself. A couple years ago the Australian federal police had detected a consignment of rice sent from Amritsar in which heroin and Ice, a synthetic drug was found in large quantity. Australian, US and Canadian governments through Interpol and CBI built the pressure for arrests. The case came to a dead end when names of some ministers were revealed during interrogation. 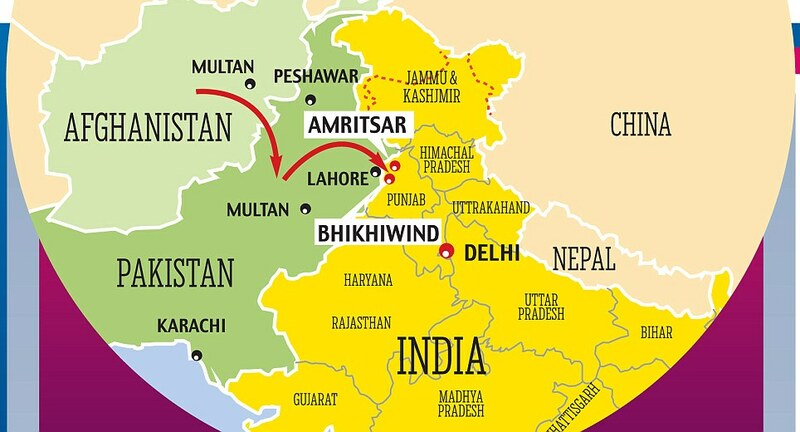 Punjab, for many years, has been a transit point for drugs from Afghanistan. The smugglers supply and receive consignments via villages bordering Pakistan. The Indian smugglers pay Rs 1 lakh for a period of six months to the owner of a field where the Pakistan smugglers leave the consignments. As the fence is electrified, smugglers use a large size plastic pipe to drop the narcotics (mostly heroin). The packets are inserted from the Pakistan side and received on the Indian side by the smugglers. The drug money has become a major source of funding of elections in Punjab and over the time a well organized drug cartel has came into existence with active connivance of politicians, police officers and drug lords. Youth in Punjab is hooked to drugs and a generation is spoiled. 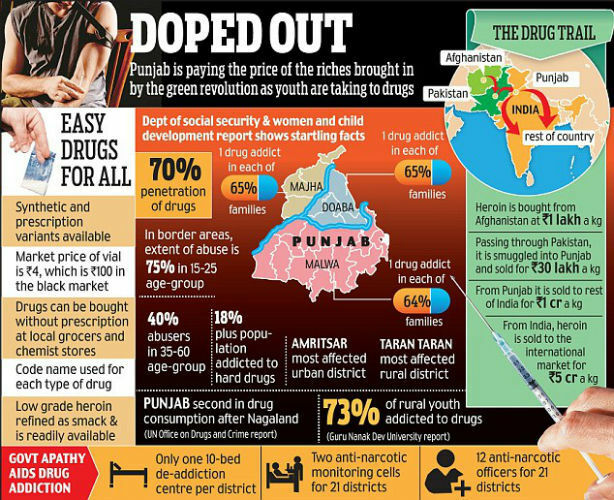 Besides being a big consumer of drugs, Punjab is a major producer of drugs. About 40 to 50 percent of synthetic drugs manufactured in Punjab are supplied to North America, UK and Europe. As explained in our East India Company Series, the East or West India Companies’ main profit source was not spices or cotton crop as usually taught in Indian text books. West India companies sold African slaves to Americas. East India Companies dealt with one of the most deadly addictive product “Opium.” Probably East India Company is the first syndicated organized international drug runner under the then British government protection as part of British foreign policy of occupying third world countries by weakening their people by drugging them. Though not under East India Company name, even today their proxies deal with the same products and their deadly variants. East India Company for its supply of opium accepted only gold or silver – the only international currency at that time. Under the East India Companies the production, warehousing logistics distribution of opium was strictly under the guidance of chosen merchant families of Anglo European descent from Venice, Bagdad and England which were protected by East India Company or British Army. Where did they produced it and to whom they sold the Opium? Using the occupied Bengal territories East India Company first time launched a large scale cropping of opium in the current Bengal and Bihar using their selected merchants from the beginning of 1800. For this they destroyed all other production of agriculture goods except cotton needed for their Manchester Cotton Mills. This resulted in the erosion of soil fertility and finally the infamous Bengal Famine where lakhs of Indian people perished. Using this opium the East India Company was able to drug entire generations of Chinese population. By the late 1830’s, there was no doubt that opium was leading to the destruction of China. By 1836, opium shipments were more than 30,000 chests, enough to supply 12.5 million smokers. The Chinese imperial army lost a battle against local rebels (triad gangs) because the army was addicted to opium. The financial drain on China in treating opium addicts was disrupting the entire economy. From 1829 to 1840, Chinese exports had brought in 7 million silver dollars, but imports, mainly opium had drained 56 million. The loss of silver was disrupting the internal economy leading to increased unrest. We can see similar parallel with the addicted cops in Punjab failing to tackle the drug menace and the state revenue and resources being drained to in treating the addicts resulting into a disrupted economy and demoralized youth and increased unrest in locals. When the Chinese Emperor said that they do not need opium as these commodities do not advance human civilization and values, EICs were enraged. England, Germany, France, Hungary, Russia, United States of America, Spain, Portugal and Italy all at once engaged China and divided the country for next 25 years to sell their valuable product they thought would advance Chinese civilization. This war occurred in the year 1900 and is called the Boxer War. Europeans won and what they did after that is history. Chinese said it was aggression. Europeans said it was for the Freedom and Democracy of China and to modernize them from oppressive rule. One can see the same statements with Iraq, Libya, Syria, Ukraine etc. There were many Indians also involved in this international drug business peddling the drugs for the East India Company and made a fortune in the process. The foundations of many reputed business houses in India today lay in this dark history of drug smuggling; Tata and Birla to name just two. These opium production activities ran until 1924 in India and were stopped with the efforts of Mahatma Gandhi who first agitated to remove opium production from India and stop destruction China using Indian soil. Finally the British transferred the entire production to Afghanistan in 1924 handing the production to southern Afghanistani tribals which after 90 years became the Golden Crescent of opium production. Though the production is in the hands of Afghan tribals the distribution finance market control is still exercised by the same old British business houses or their proxies. With intelligence agencies clandestine operatives acting hand in glove with government sponsored drug production, drug dealers, peddlers, and handlers acquired sophisticated arms that posed a challenge for many governments. With the zero investment and huge profits criminal syndicates with connections with politicians moved into business. As the addicts were ready to do anything to satisfy their addiction an associated prostitution profession and human trafficking were developed out of proportion in all those countries where the addiction starts spreading. Modern democracies like India are now ready to fall victims on the lines of China into a complete surrender to western powers because of lax laws or following oppressive British police laws. With more and more deadly addictives like heroin, cocaine, ecstasy entering Indian markets the number of addicts and the lure of profits is shooting through the roof. With no central drug policy to prosecute, with no stringent punishments to prevent, with no leader bothering about the future of Indian youth, different state police forces are grappling with this new menace of Narcotic Terrorism with their over stretched duties and understaffed personnel. With no co-ordination from central intelligence forces in understanding this narcotic menace and with suppliers embedding their interests to mainstream political parties the state police forces are clueless and directionless, though if understood they can tackle the issue effectively.